You just have to type in the city and state. You won’t see auto-complete suggestions in the search bar, and the first result will probably be labeled generically: simply “U-Haul” or “Best Buy” or whatever. But if you click on the first result you should be taken to the Google Places page of whatever location you searched for. It’s a little leap of faith. I’m still finding Google+ to be wildly confusing. It’s *so* easy to get lost. I actually just followed your instructions for a few folks we work with, and I only found the right location about 50% of the time. I can’t even explain why (or in some cases reproduce!) but that’s part of the problem. When asking customers to give feedback, if the immediate experience isn’t simple/easy they will stop. Why not just tell customers to go to https://plus.google.com/101104143943675115661/posts (or better yet, if they try to claim +PalumboLandscaping then plus.google.com/+PalumboLandscaping)? Why have them search? The instructions are the way they are because you need to accommodate people who might be using just the printed instructions, rather than instructions you send them by email (with a link). In some cases you may have to include city+state or ZIP in the search bar. Just depends on what it takes for Google to pull up the right listing on top. But that’s always been the case. 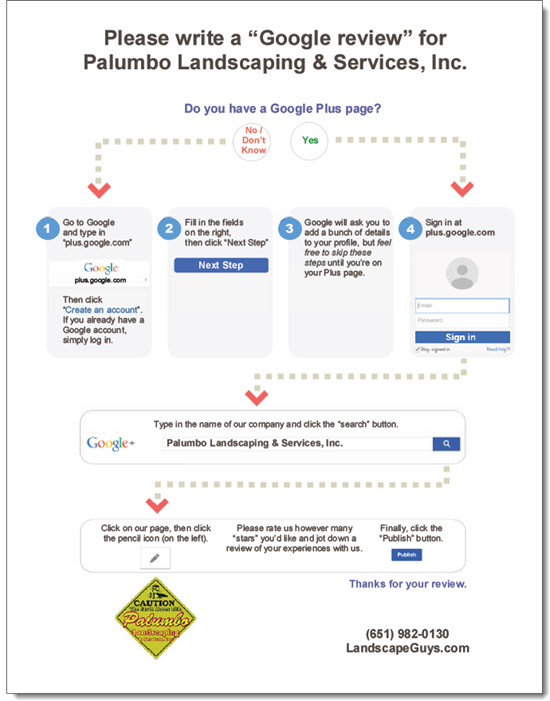 Google doesn’t make the process as easy as can be, but LOTS of people over the years have used these instructions, with success. They’re the least-difficult option for the greatest number of potential reviewers (e.g. people following printed instructions vs. email, people with or without a Google Plus page, etc.). good info phil – thanks. i realize google and google plus are far more than just business listings and consumer review sites like yelp, but google really can’t figure out a way for customers to write reviews as easily as they can on yelp? please don’t emulate yelp’s review filtering algorithms LOL, but c’mon, google … we expect better from you. Yeah, Google has put too many hoops in front of reviewers. Apparently in the coming months Google will do away with the requirement that reviewers have a Google Plus page; it’s supposed to go back to the way it was before May 2012, when all you needed was a Gmail or other Google account. But I’ll believe it when I see it. i believe google’s stated intention to remove the g+ page requirement, but even so, is writing a review going to be as obvious & easy as it is on yelp? that’s a whole other part of the equation that google has to get right. Probably not, but it will pose a dilemma, because Google Places (AKA local Plus) pages are very hard to navigate to outside of plus.google.com. Finding the right link from the SERPs isn’t reliable or particularly easy. Google’s still bungling their effort to get more “mind share” on reviews, and I don’t expect they’ll figure it out any time soon. do we know of any compelling reason why a google search for a specific business can’t produce a result that includes a simple “rate this business” link? almost sounds too simple, but seems viable & practical. There is such a link. Usually if you search for a business by name there’s a link that reads “Write a review,” right there in the search results. @phil: i’m not referring to google ‘my business’ listings. i’m referring to all google organic search results for the business. You can only review a Google “My Business” page. You can’t review an organic result for a page, and I’m not sure how that would even be useful. that’s my point … a google review can only be written via ‘my business’. why be so restrictive? why not provide more user-friendly options & flexibility? I see what you mean, but I think the issue is intent. People will just Google the business by name if they want to review it, and the link is apparent enough. Meanwhile, someone watching a video is less likely to be a current customer, and a customer who’s looking to write a review. I found the business I want to review from G+ but there is nothing there to allow me to make a comment. I then went to my Business pg and there isnow way to search for another business. I have a quick question. I wrote a review on a business page about a week ago. The review didn’t show up on the business’ page, and on my personal google+ page where it usually puts reviews I’ve written for places it doesn’t appear on there either. Did I do something incorrect? Any other time I’ve posted a review for a business it shows up on their page as well as under reviews written by me. Why is this time different? I’m not sure, Eliza. It may have gotten filtered, or you may have missed a step. When I Google my business, it doesn’t have a “Write A Review” option. How do I get that option? You’ll probably need to try a different search term – some more-location-specific variation of your business name. Thanks for your order. I sent you an email yesterday at 9:33pm EST. Please check your junk folder, in case it went there. Email me at phil@localvisibilitysystem.com if you didn’t get it. I need info on your business in order to customize the PDF.